Did you ever stop and think about how a vape works? It’s not some esoteric science, they actually rely on extremely simple methods to get going. Most of the advanced stuff is in the electronics of advanced mods. It’s not just interesting information, but also useful if you’re finding that your vape is on the fritz. Read on and we’ll discuss how your vape works. Those who have been around vaping long enough remember the old pen-style vapes which were much smaller than most of the mods on the market today. The history actually goes back a little bit further. The first “modern” vape actually showed up in 1965, it was patented by a man named Herbert A. Gilbert and never reached its commercial potential. Various designs and devices made their way to the market through the 1970’s but nothing really stuck until the nicotine inhalers of the 1990’s. In the early 2000’s they made an appearance in China but it would be half of a decade before they hit the American market in real force. Since then the industry has been in something of an arms race. The original small, pen-style vapes with high resistance coils were increasingly replaced with sub-ohm coils which allowed for more current to pass through in accordance with Ohm’s Law. Most vapers have seen the big mods which are available now. Within the last couple of years, however, things have been getting smaller with devices like the Juul making appearances. They’re a bit different as well, using salt nicotine to deliver higher doses to make up for the smaller volume of the pods. If you haven’t yet seen the tiny Juul pods, then this website explains the flavors and diminutive size of them. Here’s the thing: vapes are pretty much unchanged in their basic operating principles since the beginning. Many of us treat our vapes like any other electronic: you use them, they work, and then they don’t. They’re definitely not as advanced as a cell phone, however. The key to your vaporizer is in the coil. The basics are really simple. When you press the button or inhale, depending on the model, power goes from the battery into the coil. The coil is placed in the e-juice and reaches a high temperature in a short period of time. The temperature in a sub-ohm vape, which is the norm these days, gets higher since these coils draw more current. Originally the idea was to up the voltage but batteries hadn’t reached a point where this was feasible, so instead coils were built with a lower resistance. The current which passes through the coil is the source of the heat. Temperatures need to be well-controlled to prevent actual combustion of the liquid, but the common bases have a fairly high ignition point. 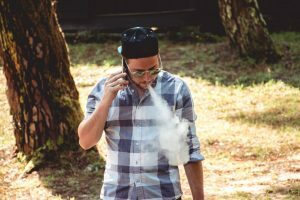 Propylene glycol ignites at around 788 degrees F, while vegetable glycerine has a slightly lower ignition temperature at 740 degrees F.
Keeping the material from combusting is the key to safer vaping and also leads to a better experience since running too hot of a temperature will cause your vape juice to taste horrible. Vapes tend to come in a couple of different forms. There are simple, inbuilt devices which just require the press of a button. On the whole, these are calibrated for simplicity and safety and the only technical work which is required is the ability to unscrew an old coil and screw in a new one. Usually, the only inbuilt electronics in these govern a single voltage and some safety circuits to prevent the lithium battery from overheating which can lead to the dangerous phenomenon known as venting. That would be “blowing up” in layman’s terms. Mods, on the other hand, allow for variables in the temperature utilized through the wattage and a temperature control. Putting up the wattage increases the current going through the coil, while the temperature control keeps things at the right temperature for what you’re looking for. These electronic controls can range from simple “up/down” wattage modifiers attached to buttons on the side and a simple LCD screen to advanced touchscreen displays which let you work with virtually every piece of the process in color and high resolution. Vaping was used quite frequently as a smoking cessation device in it’s early days, which led to the early “e-cig” models which aren’t quite as common as they used to be. These simple devices used replaceable cartridges, had a “burning” indicator LED on the end and were generally similar to cigarettes. Eventually, the big shift towards mods became a movement of its own. Lately, devices like the Juul have hit the market which signals a shift back to smaller, more compact devices. By utilizing nicotine salts a higher nicotine level is attainable in the vapor without the harsh “throat hit” which occurs when using freebased nicotine which is found in normal fluids. These devices are actually just slicker packaging on the older pen style vapes, boasting a relatively high resistance of 1.6 ohms but delivering a satisfying hit regardless. These smaller devices are more convenient to carry which has led to many people making the switch. Unfortunately, they’re also easier to hide which has caused no end to controversy when it comes to teenagers using them. Where things will go from here is up in the air, but vaping has a come a long way since the first patent was filed. The technology is still quite simple, however. Are you glad to know how a vape works? Since you’re bringing the substance into your body we feel that more people should be aware of how the technology works. The simple process of heating a coil with a battery has led to an enormous industry, replete with advanced electronics, chemical technology, and it’s own unique subculture. Want to learn more about tech? Why not check out our circuits section to see just how simple many things really are.